New York state is now issuing identity cards for people with intellectual and developmental disabilities. 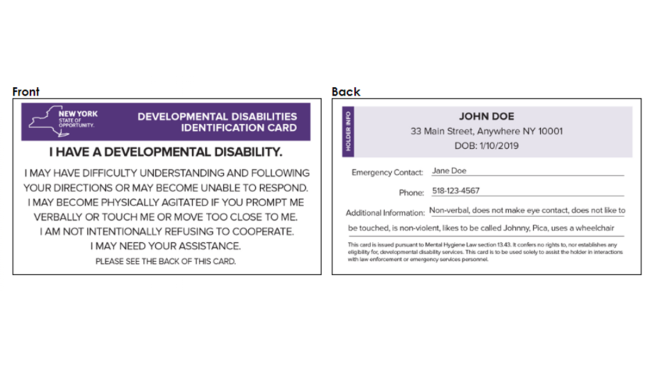 The free ID cards are designed to help police, firefighters and emergency personnel interact with people who may not be able to communicate effectively. The cards explain that the bearer may have difficulty understanding, following directions or communicating. The back of the card includes identifying information and an emergency contact. A sponsor of the legislation that created the cards, Democratic Assemblyman Angelo Santabarbara, was inspired by his son, who has autism. The cards can be requested through the state Office for People With Developmental Disabilities here.